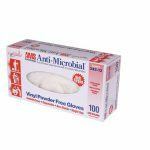 OmniShield™ AMS #3525 Series Anti-Microbial Multi-Purpose Vinyl Gloves are designed for retail, housekeeping, general purpose, or any non-medical use. They utilize built-in EPA Registered Anti-Microbial agents to protect the glove. 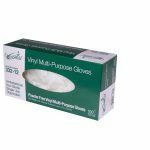 OmniShield™ AMS #3525 Series Anti-Microbial Powder-Free Multi-Purpose Vinyl Gloves are made from the highest quality polyvinyl chloride and plasticizers available. California Proposition 65 Compliant. Powder Free. Packaged 100 per box, 10 boxes per case.